Bedtime. The girls are supposed to settle. And yet, I'm reading them a poem about Zombies eating brains. And they're crying with laughter. And then, the one word poem. About poo. Lara nearly wet herself with laughter. I've been reading the girls poem's from Joshua Seigal's poetry book, I Don't Like Poetry. 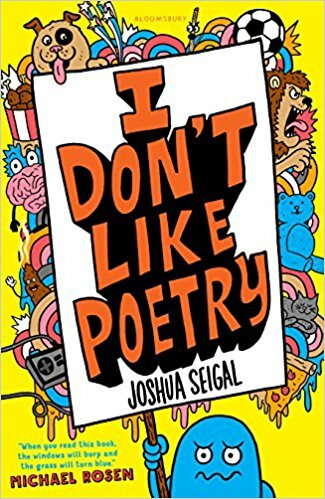 It's a wonderful poetry book that has been shortlisted for the Scholastic Lollies awards in the category for laugh-out-loud books for 9-13 year olds. Lara and I have been reading I Don't Like Poetry - it's blimming awesome. There is something very magical about reading a good poem and I'm so glad Lara feels the same way too. When Lara first heard the poem that shares its title with the book (I Don't Like Poetry), a big grin came across her face as she realised that the poem uses all of the poetry mechanics it complains about such as similes, metaphors and onomatopoeia. Lara has enjoyed this book so much that she took it to school to show her friends. There are lots of laughs but also some more serious poems on topics that older children know and understand - really strong, powerful poems. Some rhyme, some haiku, some very deep creative writing and we all loved it. I Don't Like Poetry definitely gets our vote in the Lollies.